Extension Master Gardener℠ volunteers of Dare County have earned international recognition for having a significant impact in our community. At the state level in 2018, Master Gardener volunteers of Dare County received recognition for three of their projects, winning two 1st place awards and one 2nd place award. One of these 1st place projects, the Speakers Bureau, then went on to receive an International Search for Excellence Award that will be presented at the 2019 International Master Gardener Conference. This award recognizes outstanding Master Gardener volunteer educational, group projects that result in significant learning. It is the highest award there is in the program and the first time a North Carolina Master Gardener volunteer program has ever received this honor. The accolades don’t end there. There were only seven awards granted at the international level in 2019, and North Carolina received two 1st place awards. Both Dare and Guilford County projects placed 1st in their respective categories of the International Master Gardener Search for Excellence Awards. Quite an accomplishment! The Master Gardener volunteer programs support the mission of NC State’s North Carolina Cooperative Extension Service by educating local residents about safe, effective and sustainable gardening practices that grow healthy people, gardens, landscapes, and communities. Their vision is a healthier world through environmental stewardship. Gardening on the Outer Banks can be difficult and frustrating. Master Gardener volunteers of Dare County created the Speakers Bureau several years ago to provide more opportunities for all residents of Dare County to receive gardening and environmental education. By partnering with Dare County public libraries, community, and senior centers, as well as other organizations and agencies, Master Gardener volunteers of Dare County are able to offer public education programs in the winter from Buxton to Corolla. During the summer, presentations and hands-on workshops are offered in the Master Gardener Volunteers’ Outer Banks Arboretum & Teaching Garden. For helping residents with specific questions, Master Gardener volunteers of Dare County maintain an online presence with an email account greenlineobx@gmail.com and from March through November, Master Gardener volunteers of Dare County are available in-person on Wednesday mornings at the Outer Banks Arboretum & Teaching Garden. A partnership with Dare County Government TV has resulted in a number of Master Gardener volunteers of Dare County Speakers Bureau programs being available on YouTube. The Outer Banks Arboretum & Teaching Garden is located adjacent to the Thomas A. Baum Senior Center at 300 Mustian Street in Kill Devil Hills. This beautifully maintained teaching garden is funded by the Dare Master Gardener Volunteer Association 501(c)(3), open from sunrise to sunset 365 days a year, and has handicap accessible pathways. For more information about the N.C. Cooperative Extension of Dare County, the Master Gardener volunteer program, or programs presented by the Master Gardener volunteers of Dare County Speakers Bureau please visit our website and the Master Gardener volunteers of Dare County Facebook page, or call Amy Jordan at aljorda4@ncsu.edu or (252) 473-4290. 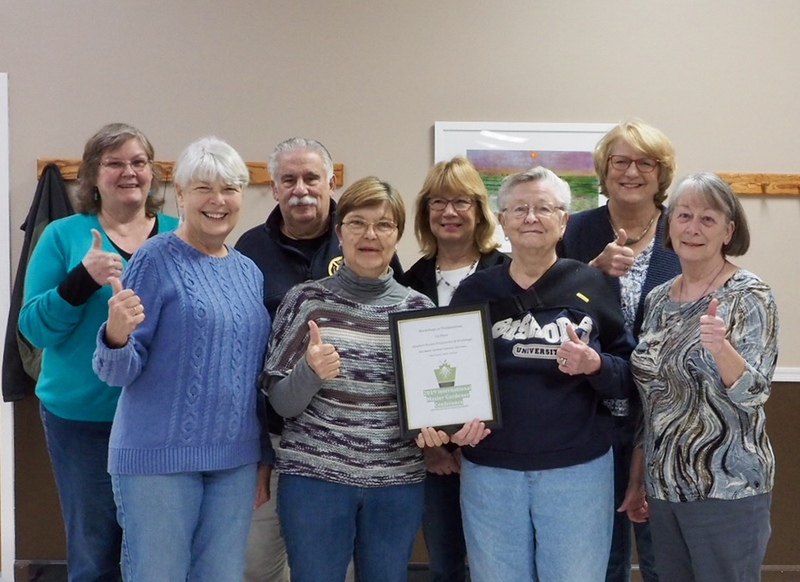 Congratulations Master Gardener volunteers of Dare County on this much-deserved recognition for providing education to all residents of the Outer Banks about sustainable gardening and landscape practices!